Home > Tips & tricks > Bookman’s Recommends: Valentine’s Day Movies! Love is in the air once again. With Valentine’s Day coming soon, many people are making plans involving chocolate, flowers, and romantic date nights at the local restaurants. But not everyone is able to enjoy Valentine’s Day. Whether they work during the holiday, don’t want to be around too much bustle, or don’t have someone to celebrate the day with, Valentine’s Day is not for everyone. So why not dine in for the night? Make a romantic dinner or order take-out, snuggle into the couch, and watch a romantic movie to pass the time. I asked the employees at the Mesa Bookman’s what they would recommend, and they gave some great responses. So here are the following romantic movies Bookmans recommends. 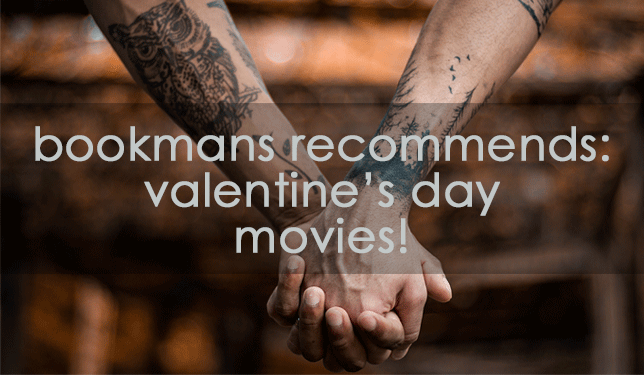 The top-recommended movies Bookmans employees suggested were a classic favorite and a lovable rom-com. The first is The Princess Bride. The second is 50 First Dates. The 1987 film The Princess Bride, starring Robin Wright and Cary Elwes as the love-struck duo, is the story of true love and the feats the pair go through to be reunited. In their own words, the employees summed up exactly why this is an all-time favorite that is a must-see. Emily enjoys how the film honors and parodies romance at the same time. Adam says he loves the romance and action in the story. Isaiah and Karli say everything about it is beautiful. Lastly, Jordan laughingly says he loves how cheesy it is. So, if you want to watch a film that features adventure and true love, give this film a chance. 2004’s film 50 First Dates, starring Adam Sandler and Drew Barrymore, is about a man who falls in love with a woman who has short-term memory loss. He has to get her to fall in love with him every day. It may sound absurd at first, but this film is actually very sweet. As Alec says, it is full of raw human emotion. Chris O. grew up with this film and is one of his favorites. Lewis found it to be very funny. Christian says it best: “Sandler’s character is committed to literally spending his life getting the girl he loves.” If you are looking for some comedy with true emotions and what people will do for love, 50 First Dates just might be the one for you. Connor recommends Spirited Away. It’s a surrealistic romance between a young girl and a water dragon as she searches for a way out of a strange forest and a way to save her parents. EJ recommends Ella Enchanted, one of his favorite movies, which is another classic version of Cinderella. Todd recommends Snow White and the Seven Dwarves, where a young girl went through a lot to wait for true love to come along, including deception, a dark forest, and even death. Jennette recommends Big Fish, for its special effects and family-friendly plot about a man’s journeys in youth, and along the way, he meets the girl of his dreams. Sean and P recommend Blast From the Past, a romantic and charming film that reminds them of their significant others. This story tells how a young man who grew up in a nuclear bomb shelter built by his parents goes out into the modern world to find supplies and instead finds love. G recommends The Proposal, an original and funny comedy where a man and his boss pretend to be engaged so she can avoid deportation, and during that time she meets his family, who can’t wait to add her to the family circle. Katelyn recommends The Holiday and P.S. I Love You. Both are her favorites. In The Holiday, two people switch homes for during Christmas times to escape their normal lives and both find new love along the way, and P.S. I Love You is how a man who has passed away helps his widow learn how to let go and move on to something happier after he is gone. Karen recommends Father Goose, a hilariously funny and smart comedy starring Cary Grant, where a man is stranded on a beach with a French teacher and her all-girl class during World War II. Anissa recommends Purple Violets, a film about forgiveness and second chances as a young woman struggles to become a writer. Eva recommends Wristcutters, a love story set in Purgatory. Roland recommends Great Expectations, a modern version of Charles Dickens novel starring Ethan Hawke and Gwenyth Paltrow. He loves the color-coding in the film and how it shows a moping teenager grows up to be a proper person. Mark recommends He Said, She Said, a story about two journalists in a relationship, and where both their point of views of each other are shown through each other’s eyes. Vanessa recommends Scott Pilgrim vs. the World, where a young man literally fights for love (it’s got a cool comic book feel about it too). Tosh recommends Interview with a Vampire, a film about a vampire’s story in romance innuendos throughout the film. We’re calling it a Valentine’s Day pick! Donna recommends Love Actually, a story that follows various relationships during Christmas, In and Out, where a Mid-eastern town teacher’s sexuality is questioned after an old student said he was gay, and French Kiss, where two people in France are striving for two different things, but find love with each other. Chris M. recommends So I Married an Axe Murder, a very humorous film where a man falls in love and marries a butcher…who might also be an axe murderer. Karli recommends Titanic and When Harry Met Sally for its quotable lines. Christan also recommends Titanic and Never Been Kissed. Kyle recommends Call Me By Your Name. Giselle recommends Celeste and Jesse Forever. Lee recommends The Perks of Being a Wallflower. What does the author recommend for Valentine’s Day? To be honest, I love all the recommendations that the Mesa Bookmans employees gave. Some I also have watched and enjoyed, and others I plan to now watch. For me, I would recommend French Kiss and Just Go With It. *The blog author’s personal note.